Ces Cru comes up with a new acronym for each of its releases. But after feeling held somewhat captive by the title of 2013’s Constant Energy Struggles, Ubiquitous and Godemis felt creatively liberated when they settled on Codename: Ego Stripper as the title of its second Strange Music album. Ditto for Ces Cru. The group formed in the early 2000s and became a duo after the release of its debut album, 2004’s Capture Enemy Soldiers. The pair appeared on a string of local releases before releasing its next album, 2009’s The Playground. Buoyed by such songs as the break-up anthem “DYT,” the chest-thumping “Float” and the politically-charged “Teeter,” The Playground impressed Strange Music co-owner Tech N9ne. 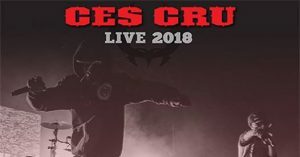 In 2010, Tech N9ne featured Ces Cru on his Bad Season mixtape and had Ubiquitous and Godemis open for him at Kansas City’s The Beaumont Club. The group then joined the Strange Music roster in 2011, released the 13 EP in 2012 and followed that up with 2013’s Constant Energy Struggles. The acclaimed collection features several singles whose videos have become viral hits: “When Worlds Collide” (more than 1.1 million YouTube views), “Seven Chakras” (more than 900,000 YouTube views) and “Juice” (more than 750,000 views) among them.